Always happy to receive an assignment in good ol' B&W, this one from Nick Jehlen, at the Progressive. 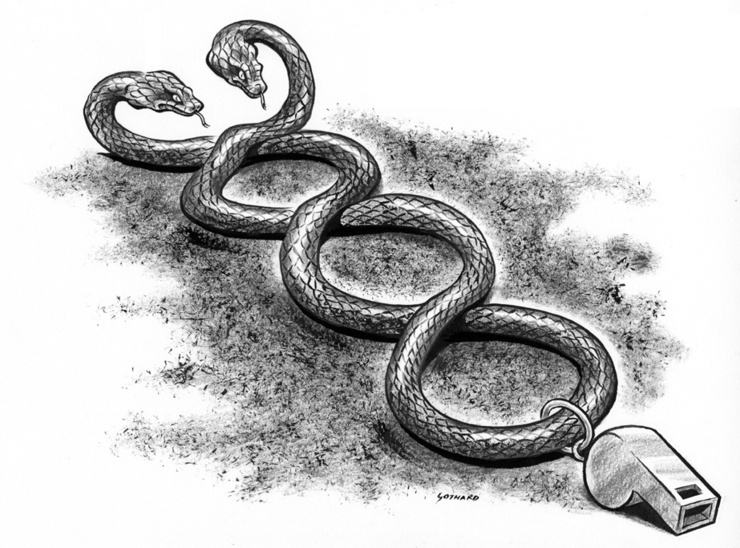 This drawing illustrates a book review of a new book written by Wendell Potter, who "is the guy who spent two decades as a top PR man for Humana and Cigna, but finally got fed up with the cruelty of the private health insurance companies. After he quit, he went public, testifying before Congress in 2009 and getting a nod from President Obama in a speech to that body." After years of working at the behest of the industry, he came to the realization that he was engaged in immoral and corrupt behavior. He is one of the few who listened to his inner voice. And of course, the industry fought back. A must read...Deadly Spin, by Wendell Potter. Nice layers of meaning in this one Dave. And the draftsmanship… very satisfying as usual!